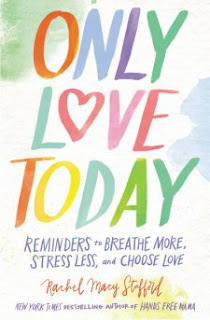 Only Love Today is the inspirational read from best-selling author of Hands Free Mama, Rachel Macy Stafford. Millions of Stafford’s fans from her blog and her books find hope, challenge, and inspiration through her poetic and powerful short pieces on her blog. Only Love Today brings these pieces and many new, original entries together in a beautiful book based around the four seasons. From finding daily surrender in the autumn and daily hope in the winter, to daily bloom and daily spark in the spring and summer, you will always find fresh beautiful words for your day. With a flexible, non-dated structure, Only Love Today is perfect to pick up at any time of the year and find hope and encouragement to address your current challenge or need – family, parenting, relationships, finding peace in a stressed out world. Stafford offers you strength and vision for a new and more connected way to live. This is a timeless book of inspiration to remember and live for what really matters. "Only Love Today" is one of my new favorite non-fiction books. I adore this book. Instantly from the first chapter, your heart immediately feels lighter than it did the day before. As a wife who has struggled to just be or to let things go, this book has helped me breathe easier. As a person who loves to serve and never stops, this book has been made me thinking about stopping and wondering how to just be and to enjoy. Life isn't in the performance, but in the small moments that you don't get to ever have back. I am learning to just enjoy and just be. If you've ever struggled with the questions of am I enough, this book will make you know that you are exactly who God created you to be. I love the practical, heartfelt and simple tips. I feel like I am having coffee with Ms. Stafford over things in my life that matter and issues that keep arising. This book comes at a perfect time in my life and I love it. I give this book 5/5 stars because this book is for the mother, wife, single woman. It spans across for women of all ages, spaces and stages of life, which I can glean from. Thank you to Zondervan for providing me a complimentary copy for review. I was not required to write a positive review. Five years ago, Rachel Macy Stafford admitted the honest answer to the question that had been a long-time source of pride: "How do you do it all?" Rachel's answer was painfully simple: "I miss out on life, and what I miss I cannot get back." That very day, Rachel began her Hands Free journey to let go of distraction, perfection, and societal pressure to grasp what really matters in life. This life-long writer and certified special education teacher felt compelled to share her journey with others through the blog, "Hands Free Mama." Using her skills as a writer, teacher, and encourager, Rachel provides readers with simple, non-intimidating, and motivating methods to let go of distraction and connect with their loved ones. Rachel's work has been featured in USA Today, TIME.com, MSN.com, PBS.com, The Huffington Post, Reader's Digest, and hundreds of other online and print publications. Her blog currently averages two million visitors a month. Rachel loves being outdoors, baking, and doing acts of kindness for those in need with her husband and two daughters who inspire her daily. I could use this book. I am always so stressed. Thank you for this recommendation. I am going to order this.